Quotes & Thought (1) – “Come forth into the light of things, let nature be your teacher”. Quotes & Thought (3) – It is the supreme art of the teacher to awaken joy in creative expression and knowledge. Quotes & Thought (4) – If a country is to be corruption free and become a nation of beautiful minds I strongly feel there are three key societal members who can make a difference. They are the father, the mother and the teacher. Quotes & Thought (5) – The medicore teacher tells. The good teacher explains. The superior teacher demonstrates. The great teacher inspires. 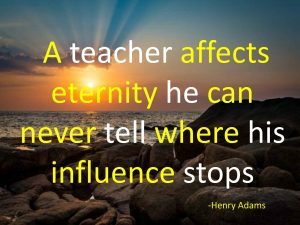 Quotes & Thought (6) – Teacher inspire you, they entertain you and you end up learning a ton even when you don’t know it. Quotes & Thought (7) – Books are the quietest and most constant of friends, they are the most accessible and wisest of counselors and the most patient of teachers. Quotes & Thought (8) – Teacher is the best friend. A teacher is respected everywhere. Quotes & Thought (9) – Good teachers are like luck, which we get from praying to God. Quotes & Thought (11) – The best teacher doesn’t give you the answers they just point the way, and let you make your own choices that you can get all of your happiness which you deserve. 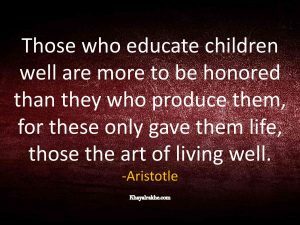 Quotes & Thought (13) – Those who educate children well are more to be honored than they who produce them; for these only gave them life; those the art of living well. 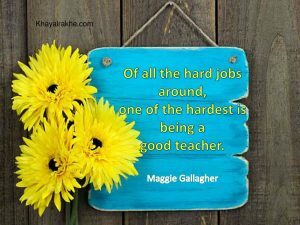 Quotes & Thought (14) – Of all the hard jobs around, one of the hardet is being a good teacher. 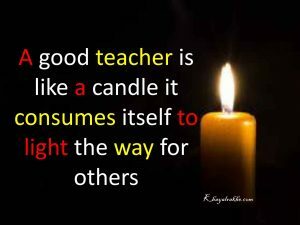 Quotes & Thought (15) – A good teacher is like a candle, it consumes itself to light the way for others. Quotes & Thought (16) – A day passed with a great teacher is better than a thousand days studying. Nice quotes Mam. Keep it up.